In 2009, I travelled alone to study in New Zealand. It was my first official trip outside of The United States (a cruise to the Bahamas doesn't count) and it very much changed the way I look at the world. I saw life in a different perspective and watched the sunset over the Pacific, the snow fall during the summer, and the moon shine with different stars. Well, the same stars from a different view. And I saw all of this 8,622 miles away from home. Since then, I have now seen the moon shine from four different places I've called home on four different continents. And each time I see it, I see it a little differently and I also see a little difference in myself. -- This picture was taken during my second week in Spain when I traveled north of Barcelona to visit an old friend. 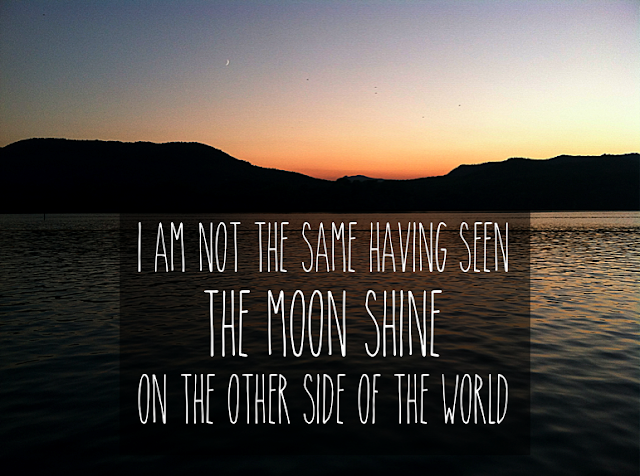 We watched the sun set and the moon shine over the Banyoles Lake.